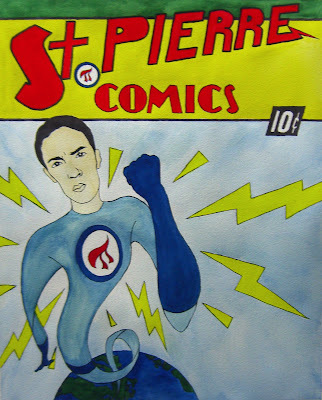 My second 'comic book' is much more literal than I had intended to be with these, but it just kind of worked with St. Pierre to have a full-out Golden Age style picture, so I did the full cover. His nickname is 'Pi,' and he's a pilot, so I used the RCAF logo but substituted a pi symbol as his superhero logo. This one was really fun to come up with.